In this section you will find Keflavik Reykjavik Airport Guide with information on Wi-Fi, recreation areas, facilities and services, traveler reviews on the airport, and the names of some airport hotels in case you decide that an overnight stay at the airport is not for you. To help organize your time at the airport, we offer traveler feedback on how they spent time at Reykjavik Keflavik International Airport. It is a small, modern airport. There are very few cafes and shops. In the public area there is a small one-stop shop that operates around the clock. Night rest at the airport is not possible, as informational announcements will constantly disturb you. Several travelers reported that airport guards were making comments to visitors who were sleeping. At the airport, bright lighting and cold enough. Best of all you will be able to sleep near the landing gates 7 and 10-15. For more information on services and amenities, go down below while continuing to study the Reykjavik Airport Guide Keflavik. Send us your feedback on the airport to help us keep this information up to date. Unlimited free Wi-Fi is available at the airport. 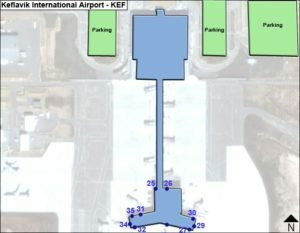 Connect to the network «Kefairport-FreeWifi». No registration required! Hotel Airport Hotel Smari — (2 min walk from the airport) located 100 meters from the airport terminal. Daily room available. Hotel Alex Guesthouse — (15 minutes on foot from the airport) a free regular airport shuttle is available during the summer season (from May 15 to September 15) from 4:45 am to 9:15 pm (check the hotel timetables). Call +354 421-2800 from the airport and the hotel’s transfer will pick you up from the arrival hall. Look for the label «MEETING POINT». Hotel Icelandair Hotel in Keflavik — (5 minutes from the airport), formerly known as «Icelandair Flughotel». Airport transfer available. Hotel Keflavik Hotel — (5 minutes from the airport) free one-way transfer from / to the airport. Hotel Hotel Berg — (7 minutes from the airport) at the hotel individual transfers from the airport can be arranged. Hotel Bed Breakfast Keflavik Airport — (8 minutes from the airport) A free shuttle to the airport is provided. To find affordable accommodation, use the Tripadvisor website, which has a list of all Reykjavik Keflavik airport hotels, as well as the ability to sort hotels by price. Rent a car — yes, see the relevant section below. Kids Corner — Games, puzzles, Lego, video games, baby seats and more. Location: in the terminal shopping area. Currency Exchange — “Arion Bank” offers currency exchange services 24 hours a day in the terminal’s trade zone. Shopping — except for the DutyFree Iceland store, the following shops are present at the airport: Elko, Optical Studio, Airport Fashion, Penninn Eymundsson, Blue Lagoon, 66 ° North, Iceland Gift Store, Pure Food Hall. All stores are scheduled according to the flight schedule. Family service — baby strollers are available for use free of charge. You can take them in the registration area. Food and drinks — all the establishments at the airport operate in accordance with the flight schedule, there is no 24-hour service. There are snack bars at the airport like Joe The Juice, Loksins Bar, House of Food, Nord, Segafredo. Luggage storage — enjoy waiting lightly with free hands! Hand over small luggage for € 8 per day, for up to one week, and for € 3 for each additional day after this period. Non-standard baggage, such as a tool or bicycle, will cost you € 10 per day, for one week, and € 5 for each additional day. Storage camera location: 500 m from the departure area, between the Enterprise and Avis car rental companies. Opening hours: around the clock (from May 15 to September 1), from 5:00 to 12: 00h. (from September 1 to October 31) and from 5:00 to 18:00 (from November 1 to May 15). Mobile Charging — More than 100 charging stations are available, located throughout the airport terminal. Smoking rooms — smoking is allowed only in a designated area next to the toilets in the departure lounge. 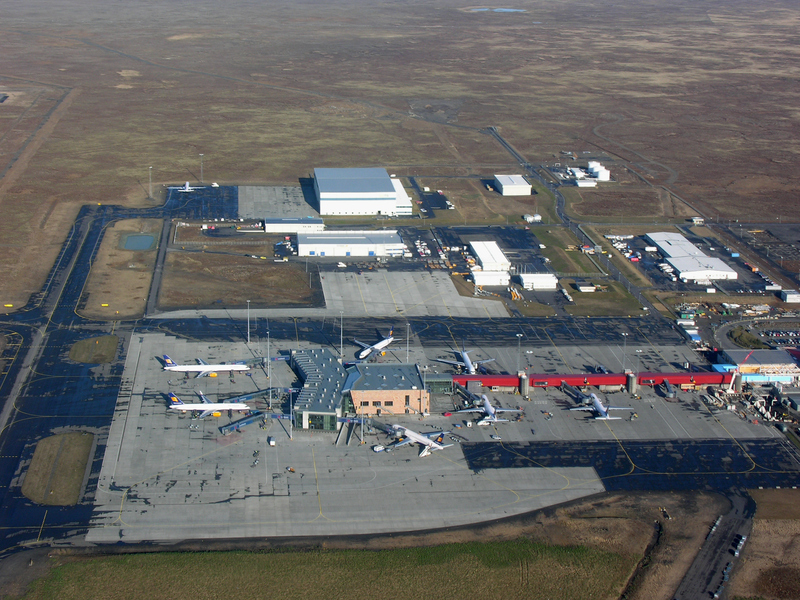 Airport Express Gray Line Iceland provides a scheduled shuttle service 45 minutes after each flight arrival. The sales office is located in the arrival hall of the terminal. The timetable can be seen on the Airport Express website. Travel time to Reykjavik is 45 minutes. If you need to get to Keflavik, the bus departs from the sales office in the center of Reykjavik at the Lækjartorg bus station. It is also possible to stop at all major hotels in the city center. Transfers must be booked in advance so that they are guaranteed to arrive at the airport. Flybus bus lines await you at the exit from the airport. Buses depart 35-40 minutes after the arrival of each flight; but you still need to check the information about the time of the actual departure of the bus on the screens in the terminal or check at the Flybus information desk in the arrival hall. The trip to Reykjavík by Flybus is 45 minutes and, if desired, it can stay at the Viking Hotel in Hafnarfjörður and Aktu Taktu in Garðabær. In Reykjavik, the first stop will be at the BSÍ Bus Terminal. Otsuda transfers are possible to all major hotels, Youth Hostel, Laugardalur camping area and to the airport domestic flights. These routes need to be asked from the drivers of small buses BSÍ bus ​​terminal. Flybus will also take you from the hotel to the airport. To do this, the day before departure, you must book at the hotel transfer for you. Taxis can be booked at the exit from the airport terminal. The following car rental companies are available at the airport: Avis, Budget, Hertz, Europcar.